The highest quality creatine supplement enriched with taurine straight from the stable FireSnake. Advanced creatine matrix, which includes modern forms of creatine like creatine malate, the highly praised orotate, to the latest in creatine - creatine gluconate! Bet on QUALITY! Scitec Crea-Bomb - 1 sasz. Diversity and activity in the group are undoubtedly many advantages. Do not participate in pointless debate about which type of creatine is the best - use many types! The normalization process of protein synthesis + neuroprzewodnictwa normal functioning of the nervous system and the process of muscle contraction, including the heart muscle fatigue + + Inhibition of normalization energogennych metabolic normalization of physiological + + + The correct balance of electrolytes Maintain good condition of bones and teeth. * These statements have been scientifically proven and authorized by the European Food Safety Authority (the European Food Safety Authority). Dissolve the one portion of 400 ml of water. 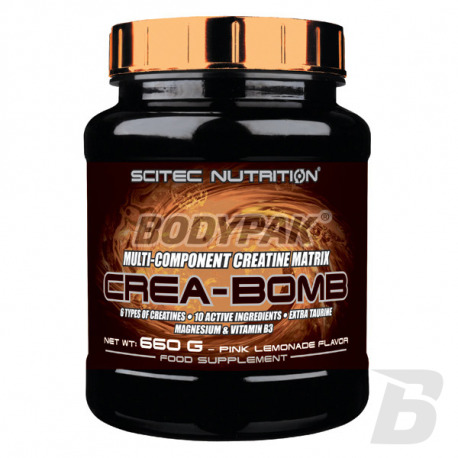 In the charging phase of creatine daily it is recommended to use one portion of the product CREA-BOMB for every 15 kg of body weight (in this way the muscles are saturated with creatine faster). Unfold the total amount to eat a few servings a day, eat before meals. After 5 days, reduce the daily intake of product to one portion of the product (6 g) in order to maintain the creatine in the body. If you do not want to carry out the loading phase immediately start use 1 serving a day. 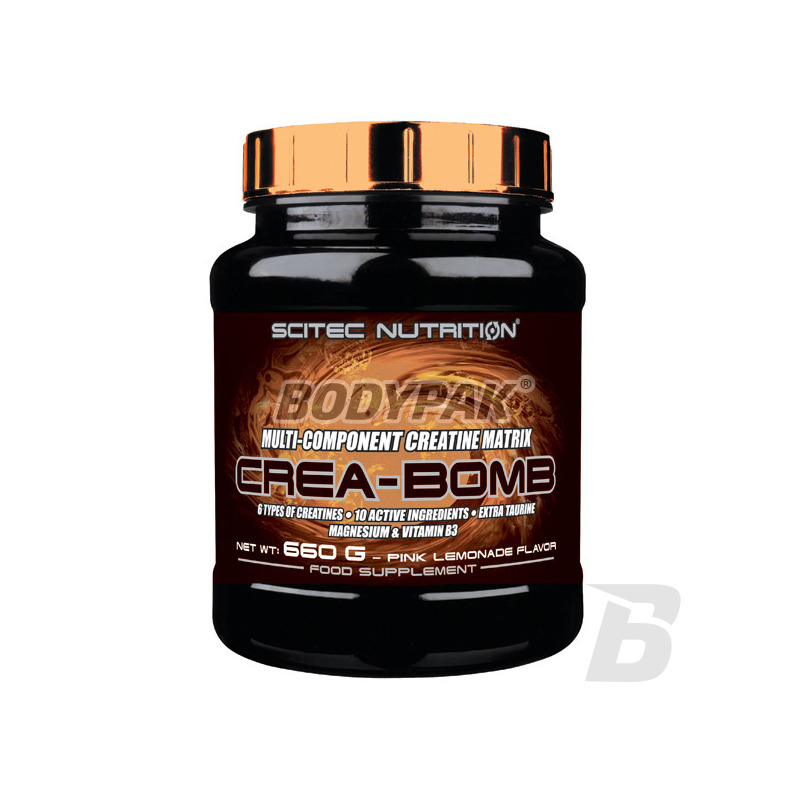 --- Patented blend of "CREA-BOMB"
Ingredients: Creatine Monohydrate, Taurine, flavor (passion fruit), magnesium oxide, sweeteners (Sucralose, Acesulfame K), Micronized Creatine Monohydrate, anti-caking agent (tricalcium phosphate), pigments (Riboflavin, CARMOISINE **), Kre-Alkalyn [ creatine monohydrate buffered] creatine Pyruvate creatine anhydrous creatine citrate, malic acid, nicotinic acid amide. Bardzo mocny matrix kreatynowy, zarówno siła jak i masa na duży plus - tego szukałem! Produkt rewelacyjny. W połączeniu z FireSnake Remedy, Dextrosą i boosterem testosteronu zyskałem +2 kg suchego mięsa w 5 tygodni. Unique combination of a sports dietary supplement until 9 most effective forms of creatine. Strong stak creatine in the form in powder. Reach incredible strength and muscle mass!